Rafael Nadal beat Tomas Berdych 6-4 7-6 to book his semifinal place at the Masters 1000 tournament at Indian Wells in California. (CNN) -- World number three Rafael Nadal booked his place in the semifinal at the Masters 1000 tournament at Indian Wells but he was made to work hard by Czech Tomas Berdych. Nadal won 6-4 7-6 in two hours, 11 minutes to set up a final four clash with Ivan Ljubicic, who beat Argentina's Juan Monaco in Thursday's first match. Nadal had lost three of his previous five hard court encounters with Berdych, but started well by breaking his opponent in the opening game. Berdych hit back to level things up at 4-4 but Nadal broke again to tie up the first set. The pair swapped breaks in the second set before Nadal won the tie break 7-4 to seal his place in the semifinal. 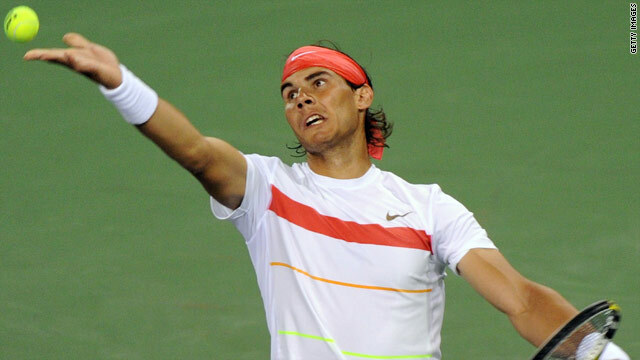 "It was a very good match," Nadal told the official ATP Tour Web site. "I played really well, especially the first set. The first probably eight, nine games of the match was [at an] unbelievable level; later the wind came a little bit and it was more difficult to play. The first probably eight, nine games of the match was [at an] unbelievable level. "But anyway, we were still playing, kept playing at high level, and this is very important. Very good news for me to be in semi-finals. I like be here and I like to have a match to fight to try to be in this final." Ljubicic lost the opening set to Juan Monaco but fought back to win 4-6 6-2 6-1 in just under two hours. The 31-year-old told the official ATP Tour Web site: "The conditions suit my game perfectly. It's nice and dry. The ball goes through the air pretty quickly. The court is slow enough so I can return well, as well. It's just perfect." In the women's draw sixth seed Jelena Jankovic was broken just once by opponent Alisa Kleybanova, from Russia, in her 6-4 6-4 victory to reach the last four. Jankovic will now face eighth seed Samantha Stosur after the Australian beat Spain's Maria Jose Martinez Sanchez 6-3 7-6.